 THIS GOLD NECKLACE LOOKS AND FEELS LIKE AN EXPENSIVE 18K GOLD CHAIN (or 14k gold chain). 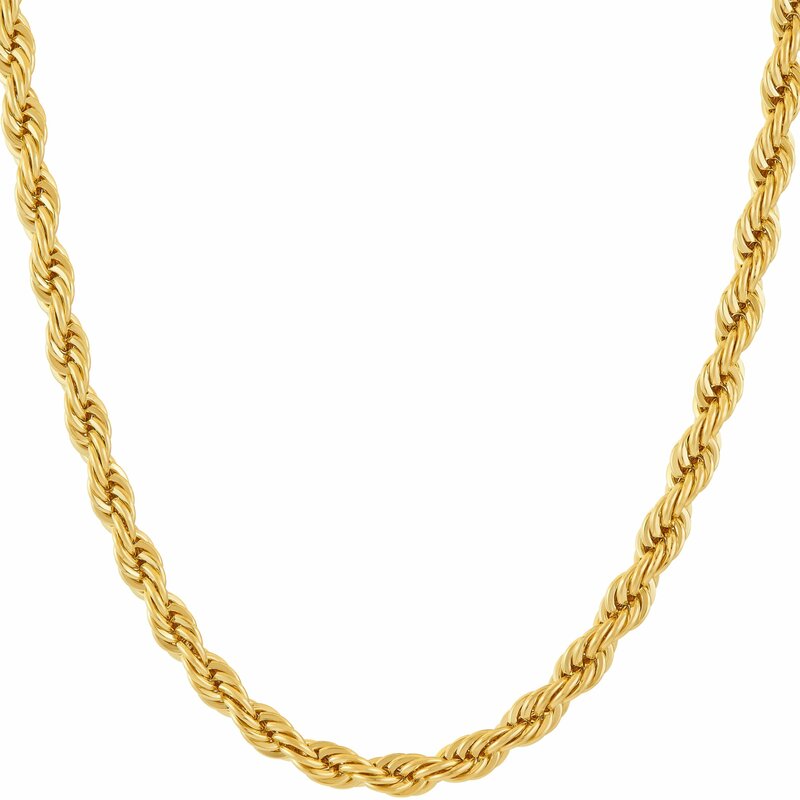 Wear this gold rope chain with confidence, as only your jeweler will know that this gold plated chain is not solid gold. The preferred jewelry for women and men alike, our necklace chains have quality clasps that stay closed and don’t catch your hair. These gold chain for men and gold chain for women are designed with only the HIGHEST QUALITY CRAFTSMANSHIP.  NO NEED TO SPEND A FORTUNE FOR A SOLID REAL GOLD CHAIN FOR MEN. Our necklace is the next BEST thing to solid gold. Whether looking for gifts for women, a statement necklace, a simple necklace chain, a gold necklace, costume jewelry for women or birthday gifts for men, look no further than our Lifetime Jewelry. OUR SIZES INCLUDE: 16, 18, 20, 22, 24, 26, 30 and 36 inches. SEE SIZING PHOTO. We also offer a gold rope chain in 1mm, 2mm, 3mm, 4mm, 6mm and 7mm as well as Cuban Link Chain.  WE PROMISE LIFETIME REPLACEMENT OF ALL OF OUR Lifetime Jewelry necklaces – FREE OF CHARGE. If it ever breaks, tarnishes or simply doesn’t live up to your highest expectations, we will replace your gold chain necklace with a new one for as long as you own it. We mean it when we say BUY IT ONCE and WEAR IT FOR A LIFETIME. Get your gold cross necklace for women now. Gold necklaces may look the same in pictures, but there’s more than meets the eye – whilst some may look cheap or turn your skin green, others break, tarnish or turn black, or their clasps refuse to stay closed. Our Lifetime Jewelry premium pendant necklace and men necklace have 20 times more 24k gold plating than others, are fashioned with stronger semi-precious metals and will last you all the time. Buy once and wear for a lifetime or we’ll replace it free of charge. Looks and feels like an expensive gold chain but is much stronger. The strength of our semi-precious metal core is preferable even to stainless steel. Our mens chain necklace (cadenas de oro para hombres), and gold necklaces for women (cadenas de oro para mujeres) have the highest quality craftsmanship and are considered tops in mens jewelry and the most desirable mens gold chain as they are very affordable and have quality clasps. 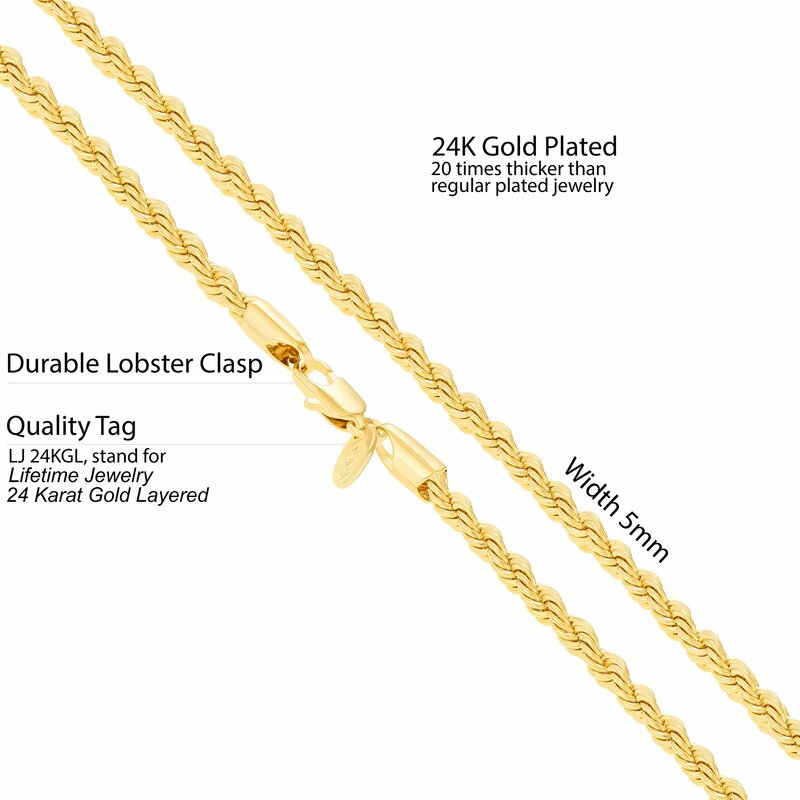 When On the lookout for mens necklace chains, a gold chain for women, gold necklace for men or necklaces for men as anniversary gifts for men, Lifetime Jewelry chains & necklaces are the perfect choice. Sizes include: 16, 18, 20, 22, 24, 26, 30 and 36 inches. We also offer a gold rope chain in 1mm, 2mm, 3mm, 4mm, 6mm and 7mm as well as Cuban Link Chain. Just search Amazon for Lifetime Jewelry Chains. We promise lifetime replacement of all our Lifetime Jewelry – free of charge. If it ever breaks, tarnishes or simply doesn’t live up to your highest expectations, we will be able to replace it free of charge for so long as you own it. We mean it when we say buy it once & wear it for a lifetime! Our goal is to provide jewelry that looks and feels like solid gold at a fraction of the cost. For over 30 years, our family-run small business has stood for integrity, proudly creating jewelry “Made in the USA” with the highest quality craftsmanship, materials and customer give a boost to. We expect the best for our family so we give the best to yours.  THIS GOLD NECKLACE LOOKS AND FEELS LIKE AN EXPENSIVE 18K GOLD CHAIN (or 14k gold chain). 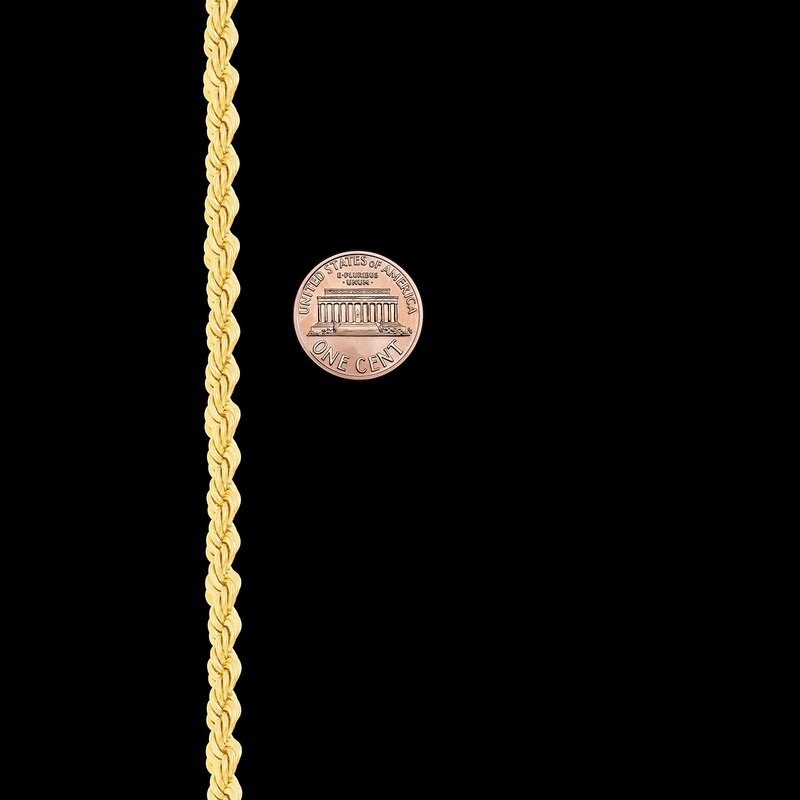 Wear this gold rope chain with confidence, as only your jeweler will know that this gold plated chain is not solid gold. The most well liked jewelry for men and women alike, our necklace chains have quality clasps that stay closed and don’t catch your hair. These gold chain for men and gold chain for women are designed with only the HIGHEST QUALITY CRAFTSMANSHIP.  NO NEED TO SPEND A FORTUNE FOR A SOLID REAL GOLD CHAIN FOR MEN. Our necklace is the next BEST thing to solid gold. Whether On the lookout for gifts for women, a observation necklace, a simple necklace chain, a gold necklace, costume jewelry for women or birthday gifts for men, look no further than our Lifetime Jewelry. OUR SIZES INCLUDE: 16, 18, 20, 22, 24, 26, 30 and 36 inches. SEE SIZING PHOTO. We also offer a gold rope chain in 1mm, 2mm, 3mm, 4mm, 6mm and 7mm as well as Cuban Link Chain.  WE PROMISE LIFETIME REPLACEMENT OF ALL OF OUR Lifetime Jewelry necklaces – FREE OF CHARGE. If it ever breaks, tarnishes or simply doesn’t live up to your highest expectations, we will be able to replace your gold chain necklace with a new one for so long as you own it. We mean it when we say BUY IT ONCE and WEAR IT FOR A LIFETIME. Get your gold cross necklace for women now. ❤️ WHILE GOLD CHAIN FOR MEN & GOLD CHAIN FOR WOMEN LOOK VERY SIMILAR IN PHOTOS there is a world of difference: many break, tarnish & turn black, turn your skin green, look cheap and their clasps don’t stay closed. Our Lifetime Jewelry premium gold chains HAVE 20 TIMES MORE 24K REAL GOLD PLATING than others, are stronger and will last you all the time. You’ll BUY IT ONCE and wear it for a lifetime or we’ll REPLACE IT FREE OF CHARGE. On the lookout for gold jewelry for women or jewelry for men? We got it!